A few months ago, I shared with you all my struggle to deal with the excessive amount of stuff that we have accumulated. I shared how I started with my girls’ bedrooms. They literally spent all day (9-4) cleaning and organizing their room. By the end of the day they LOVED their room. There was SO MUCH STUFF. It was once again… overwhelming. I started by having the girls help me sort. By lunch time, though I had decided this was a job I needed to do myself. So I gave them the “gift” of watching a movie while mommy cleaned their playroom. They were thrilled. So was I.
I decided my plan of action was going to change. I needed to just get everything OUT OF THE ROOM. I needed a blank slate. Needed to be ALLOWED to only put back in what we wanted. So I went through their toys, put them in bins, baskets, tubs. Threw away the broken things and trash. At this point I did not even really even sort their toys. I just wanted it all out of the room. Whoah. Headache gone. It was at this moment that I realized how much the “stuff” in our house adds to my stress level. I invited my girls upstairs to see what mommy had done. I was REALLY nervous and not quite sure I was ready to deal with the whining or tears that would start once they saw all of their toys gone. There were no tears. No questions. No whining. They smiled. They danced. They spun around and around in the empty room. I almost fell on the floor. Were they really smiling? YUP! Not what I expected AT ALL! So you may be wondering… is she going to take away all their toys and leave them with an empty playroom? That night and over the next few days, I slowly added in a few SELECT things. I started by adding back some (but not all) of their kitchen food, dishes, pots and pans. I added a basket of chalk for their chalkboard wall. I added a basket of wooden blocks. I put a small basket of hot wheel cars on their car rug. That was it for a few days. I had put all of the “extra” toys in our guest (aka storage) room while I decided what to keep and what I was going to get rid of. I set a rule that NO ONE could go into that room and take any toys out or exchange toys. So far I have had no problems with this! It’s working. It’s amazing. My kids have enough with only a few things. Not only does their playroom take about 10 minutes to clean up. The rest of the house is cleaner too! They are not dragging all of their toys downstairs to play with because there are not a lot of toys to bring downstairs anymore! I still haven’t decided what I am doing with every single thing I have stored away right now. Some will donate, some we will sell and some we will put in the closet to pull out on a “rotation” basis (if one set of toys comes out, another set of toys goes in the closet). I just want to encourage all you momma’s out there that it is worth it to minimize your kids toys. Try it… Just do it. Stop wishing that your kids didn’t have so many toys. 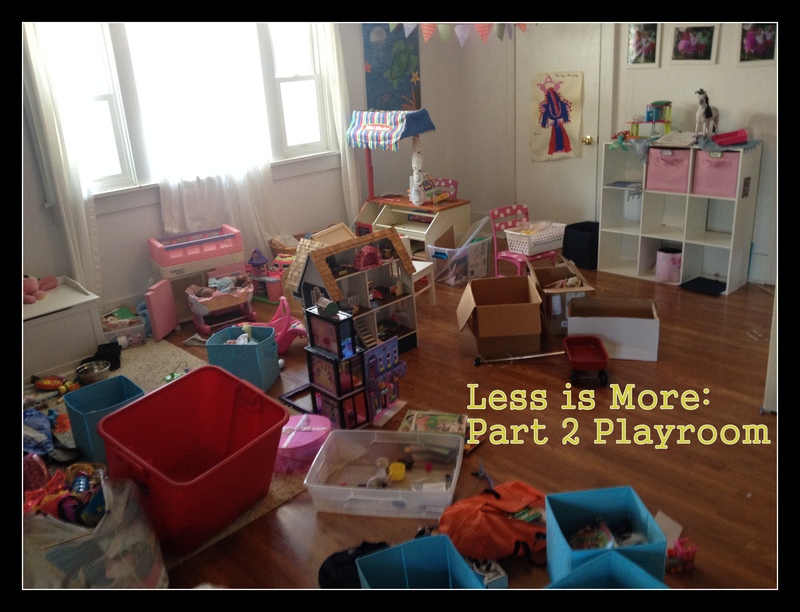 Stop trying to “Reorganize” and find the best solution to deal with the amount of toys in your home and minimalize. This may look different for you. Your kids may have more or less toys out than mine. Your kids have different “Favorite” toys than mine do… but trust me, it’s worth it.Totally and completely. 3. Now do a little SPIN in your EMPTY playroom. Imagine all the possibilities now that you can START OVER! 4. Invite your kids up to dance, spin and laugh with you. 6. Remind your kids that they are not to take toys out of the closet, basement or wherever you have stashed the toys taken from the play space. 7. For one day enjoy the room as a Blank Space. 8. The next day YOU, as mom, decide on a few select toys to bring back into the room. 9. That night start asking your kids what “specific” toys they miss. Discuss whether you want to put that back into the play space now or later. 10. When you feel up to it… start going through all those toys you have stored away and decide if you are going to KEEP and put BACK in the play room, KEEP but put in a tub for “rotation” basis in the playroom (one toy in, one toy out), KEEP but put in storage for a garage sale or DONATE. I am finding SO much more freedom now in being able to chuck toys into the “garage sale” pile. My goal was to sell the toys we are done with and use that money to buy one or two REALLY NICE, quality items. We ended up purchasing MagnaTiles and my kids LOVE them! They play with them all the time and they are wonderfully creative! Just know that sorting and going through stuff one time will not be enough, sorry! I am a few months down the road from having done this project and it’s time to do it again! The stuff just accumulates. Just know that every few months it will be time to do it again and hopefully it will get easier and easier! Looking for Peace in all the wrong places…. I clean. I organize. I reorganize. I declutter. I have “me-time.” I invite others over for dinner. I plan. I prepare. I am in control of most of my day. I’m on a search for Peace… and I’ve been looking in all the wrong places. It’s been said (by me) that if you were to walk into my house and it’s a crazy mess that would be a good indicator of the state of mind at any given point. When you walk in and see a crazy, messy, unorganized, chaos of a house… well- welcome to my crazy- messy- unorganized chaos of mind. But I don’t want to be that person anymore. I don’t want to co-relate the way my house looks with the lack of peace on the inside. The PEACE I need can’t be found EVEN in a CLEAN HOUSE. The Peace I need starts with Jesus. Starts with doing NOTHING. Starts with being Mary. Starts with sitting and being in the presence of the one who sustains peace. I have this backwards almost daily. I strive to find peace in the order of my day, things accomplished, the ability of MYSELF to keep my home maintained, my family fed and my girls educated. I am looking for peace in those things. From what I can do. Can you relate? I had lunch with some sweet friends of mine a few weeks ago and they pinpointed on the head what I have been feeling. One friend had just returned from a missions trip to Venezuela. Describing to us a birthday party her Venezuelan friends threw for her she went on to say that these people brought her into their home, took her back to their bedroom and dressed her beautifully for her party- and that their bedroom was A MESS. Their house was a mess. What stuck out to my friend was that they didn’t care about their mess. They didn’t apologize for it. They didn’t try to hide it. They didn’t try to run around and exhaust themselves straightening everything up. All they cared about was that their guest was honored, was comfortable, had food, was shown love and that she had fun. They didn’t find peace in their surroundings… peace and joy was found in showing HIS love to others by focusing all their attention on their guest. This year… is the year of Simplifying. Of Margin. Of Rest. Of Relationships. Of being myself. Inviting others into my home to focus on making them feel comfortable, loved, appreciated and heard. This year I am letting go of trying to find PEACE in a clean, organized, simplified house- and will turn to Jesus for my Peace. We can show the love of Christ and it doesn’t have to be in a 100% spot free, freshly vacuumed, organized, magazine picture perfect of a home. It can be in our dust, dirty kitchens, laundry covered couches and at our sticky tables. I will do it. Will you join me? Will you invite a friend over into your reality this week? Spontaneously call a friend who needs some encouragement- start the coffee or heat up some tea and just sit and listen. What a difference a mess can make. I think so! And when you start to get frustrated, angry and overly dramatic about how messy your house is and how it makes you feel… take a look inside and see if peace from the source isn’t what you need instead!